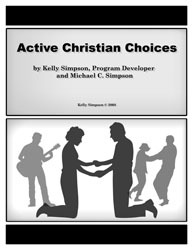 Active Christian Choices is intended for singles who want to enhance relationship skills and who want to increase skills for wise choices for romance and commitments. Topics include: the qualities of healthy relationships (what works), relationship phases and stages, expectations of responsibilities, beliefs about marriage, successful communication, emotion management and conflict resolution, money management/teamwork, extended family expectations, blended families, healthy co-parenting when marriage is not an option, responsibilities toward children, wise choices in friends and dating and maintaining love and intimacy. Sessions include assessments, discussions, and experiential activities. This curriculum is written from a Christian lens and includes Biblical references – Authored by Michael C. Simpson and Kelly Simpson, MA, LMFT.